Do you notice your incoming links today? This is for the WordPress.org users. On your admin panel, do you notice the incoming links seem to be showing every blogs that link you on the sidebar? 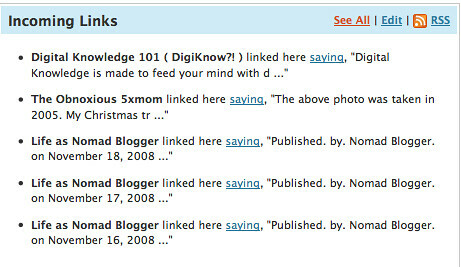 Usually, the incoming links only show the permalinks which mention and link to our blogs. However, today I notice every blog that links me on the sidebar showed up as well. Change the URL and it will show a list of the blogs that link to you. BTW, does anyone know a good plugin or give me the code where I can put my blogroll on a page instead of the sidebar. Some of my themes are not compatible with certain plugins and I cannot put my blogroll. I dislike putting on the sidebar because my link is a mile long. I realised this happening last week then it stopped for a few days where only people who link to you are highlighted. Then, its started happening again. I noticed it happening too since last week. But the incoming links has always been unstable. Sometimes the recent links will go missing and I see past links, then a few days later the recent links come back. Write a new page, copy all your blogroll links on that page, publish it, direct a one line link “Blogroll” on your side bar to the permalink of this page? Yeah, I just noticed now… usually don’t look there. I would like to see the date when these back-links were posted… but I think that option is limited. There are a ton of other folks linking to your blog. Regarding the blogroll plugin, I like to include all links manually… and even add a small blurb on each one. You give a better impression to other bloggers you’re linking to, don’t you think? my incoming link from my wordpress is diffrent with google and i wouldrather believe with google. yup. i realease too. When i check it, its not in their post. Maybe because at sidebar..
i think you should try to put your blogroll using codes and not plugin.. just paste the code at a new widget. There have a plugin to setup the blogroll on the page. It call Blogroll Page Plugin. But you must use the older plugin.. The upgraded one is not suitable for wordprss 2.6 and above..